One of the most awe-inspiring places known to man, Cappadocia entertains endlessly, with stupendous views of what could be a sci-fi movie set, but in reality is an extraordinary combination of hills and rocks. 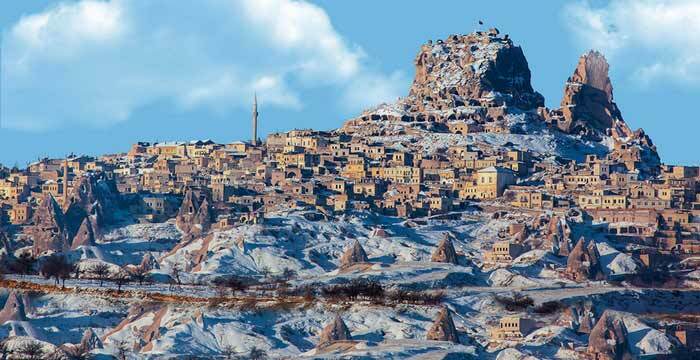 Situated in Central Anatolia, it is made up of the Nigde, Aksaray, Nevsehir, Kirshehir and Kayseri provinces. The history of this area is illustrated in the Goreme Open-Air Museum, which contains relics over 10 centuries old. This famous repository is world-famous and kills a good couple of hours. In the Byzantine era, around the 11th century, it was a monastery and a variety of religious bodies inhabited it for several decades. It then became, in parts, a shrine to a patron saint. Cappadocia is a popular pilgrimage, with no less than three saints living here at one stage or another. In terms of agriculture, the area is famous for fruit, potatoes and wine, so get ready for some of the best Turkish cuisine available. The area is a hugely popular tourist destination, beloved for its unique areas of historic, geological and cultural features.